"blackface" backlash - an over-reaction? Or a long overdue one? Reading comments about the white woman who was recently lambasted for darkening her face to cosplay Whoopi Goldberg's character Guinan from Star Trek, I feel like there is an underbelly of the issue that is being missed by many of the white people in the discussion, and not necessarily brought up by the people of color, either. I appreciate comments saying that someone's race is not something you should put on as a costume when depicting characters they played - that in and of itself is a good point, and an interesting one. But I feel that simply calling what the woman did "blackface" fails to really connect most people to some of the wounds that are at play here. Largely because current/younger generations, especially white people, have little-to-no awareness or concept about how pervasive blackface minstrelcy was, to what purpose it was used, and how it has continued to influence how characters of color are depicted in theater and the media, and also how people of color are perceived on the street. If you are confused by the level of emotion invested in the backlash directed at this white cosplayer, I encourage you to read Let Black Kids Just Be Kids, a recent and very relevant New York Times Op-Ed by Robin Bernstein. Berstein draws a very credible connection between the practice of blackface minstrelcy and the current patterns of perception that contribute to tragedies like the death of Trayvon Martin and the daily overpolicing and underprotecting of black kids in America. Bernstein goes on to explain, "only white kids were allowed to be innocent. The more that popular writers, playwrights, actors and visual artists created images of innocent white children, the more they depicted children of color, especially black children, as unconstrained imps. Over time, this resulted in them being defined as nonchildren." “Uncle Tom’s Cabin,” one of the most influential books of the 19th century, was pivotal to this process. When Harriet Beecher Stowe published her novel in 1852, she created the angelic white Eva, who contrasted with Topsy, the mischievous black girl. Stowe carefully showed, however, that Topsy was at heart an innocent child who misbehaved because she had been traumatized, “hardened,” by slavery’s violence. Topsy’s bad behavior implicated slavery, not her or black children in general. The novel’s success prompted theatrical troupes across the country to adapt “Uncle Tom’s Cabin” into what became one of the most popular stage shows of all time. But to attract the biggest audiences, these productions combined Stowe’s story with the era’s other hugely popular entertainment: minstrelsy. Topsys onstage, often played by white women in blackface, were adultlike, cartoonish characters who laughed as they were beaten, and who invited audiences to laugh, too. In these shows, Topsy’s innocence and vulnerability vanished. The violence that Stowe condemned became a source of delight for white theater audiences. 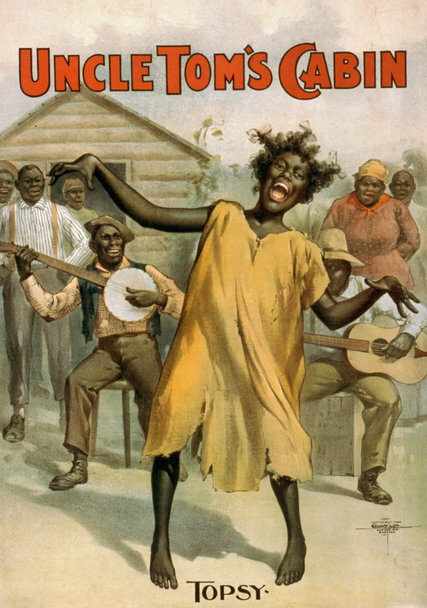 This minstrel version of Topsy turned into the pickaninny, one of the most damaging racist images ever created. This dehumanized black juvenile character was comically impervious to pain and never needed protection or tenderness. Other Blackface Minstrel characters created or perpetuated equally damaging stereotypes of black people, almost all of which were used only as comic relief, and young white people today are largely ignorant about those characters and performances, which continued into the 1970s in some places. Heck, most of us don't even know or think about where the term "Jim Crow" came from. Sometime around 1830, a white NYC ctor named Thomas D. Rice learned a popular African-American song-and-dance routine, based on the myth of a trickster figure, an escaped, possibly physically disabled slave named Jim Crow, who would dance and boast. His face blacked out with burnt cork, Rice perfected the act and sparked the tradition of the minstrel act. At first the blackface character was actually a smart and sympathetic one. But as time went on, the minstrel show took on a more racist tone. Blackface Minstrelcy was very popular in the US in the 1830s and 1840s, but it continued to be practiced well into the 1900s and its legacy continues in the lack of African American characters of content who have primary roles in mainstream US media (books, film, plays, tv shows, etc). This legacy has caused an implicit bias in almost all of us, too little acknowledged, and is very hard to address with counter-cultural re-programming, especially while white people continue to dominate the production fields of those media. If you think people are over-reacting to white people who darken their faces to portray people of color, please take a step back and learn more about why they are reacting the way they are. On the topic of depictions in film and theater, btw, I highly recommend you read the historical fantasy novel Redwood and Wildfire, by playwright Andrea Hairston. In 2012, Alex Dally MacFarlane wrote at length and with eloquence on Feminist SFF: Female Friendships, or rather the near-total absence of female friendships in SFF. You might recall I wrote, well, er, ranted, about this topic back in 2006. It's nice to see I'm not the only one who notices it's still a THING. As an aside, I'm happy to report that Tobias S. Buckell, whose Crystal Rain I called out on this issue in my first post, put more female characters and more female relationships and mentorships in The Apocalypse Ocean, which is a later work in the same universe (The Xenowealth Series, Book 4). I highly recommend it. Check out the Penguicon 5.0 website if you might consider coming to Troy for a combined science fiction/linux/open source programming convention with swordfighting, music, gaming, dancing, parties, a dealers room, and such luminaries on the program as systems security expert Bruce Schneier, nanotech industry guide Christine Peterson, webcomic artists Randy Milholland (Something Positive), The Ferrett (Home on the Strange), and Rob Balder (PartiallyClips), Gaming hero Steve Jackson, and SF authors Charlie Stross, Elizabeth Bear, John Scalzi, Nick Sagan (Carl Sagan's son), Karl Schroeder, Sarah Zettel, Tobias S. Buckell, and Sarah Monette. Online registration is open until April 15 at just $45 for the weekend. I will be busy for the convention being Charlie's GoH Liaison, which I expect will be a lot of fun. I'm also on a couple panels (Getting Things Done and Women in Technology, last I checked). Rikhei and Hope and I would welcome a fourth female roommate if you're looking for a room (the hotel is sold out). If anyone has a room staying over to Monday morning I could crash in, that would be a help, too. Go Us! Or, at least, our Go our Science GoH! I'm pleased to note that ConFusion's Science GoH, PZ Myers, has the top ranked Science Blog in Nature.com's list of Top 50 Science Blogs, which follows technorati rankings. PZ's blog, Pharyngula, is subtitled "Evolution, development, and random biological ejaculations from a godless liberal" and I suspect most of my readers would find something there to enjoy. Leafing through online short fiction, came across Intelligent Design, by Ellen Klages. Made me smile, it did. I spent the long weekend (Thursday evening-Monday morning) at ConFusion in Troy. On the whole, it was fun, but I was missing a lot of people (either people who were there, but not with me at the time, or people who didn't come this year), and in general nothing was as magical as it was last year. There were some new things, though. I MC-ed the Chuck Roast (Where we roasted Fan Guest of Honor Chick Firment) and I participated in the Writer's Workshop. Both those things went really well, but I was also prepping for them right up until they started and I was pretty stressed about that. After the Roast Saturday afternoon I expected to relax a lot, and I did some, but I had a headache I'd had more or less since Thursday night. Sadly it didn't occur to me to medicate myself for this headache until lunchtime Sunday. I didn't sleep well Thursday night or Friday, and that impacted me for the rest of the weekend. Saturday night I slept better but not very much. Sunday night I finally got a full night's sleep and felt a lot better. Most of the highlights of the weekend (other than the workshop and the roast) had to do with small visits directly with particular people.